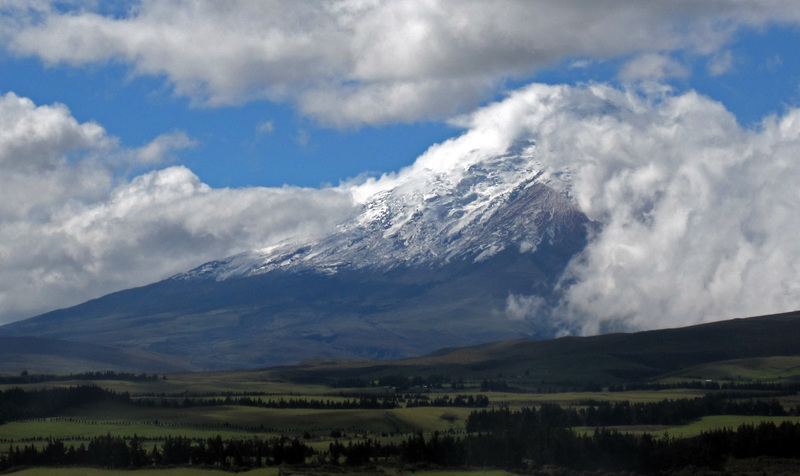 Clouds clear up to reveal a recent snowfall on the Cotopaxi volcano. 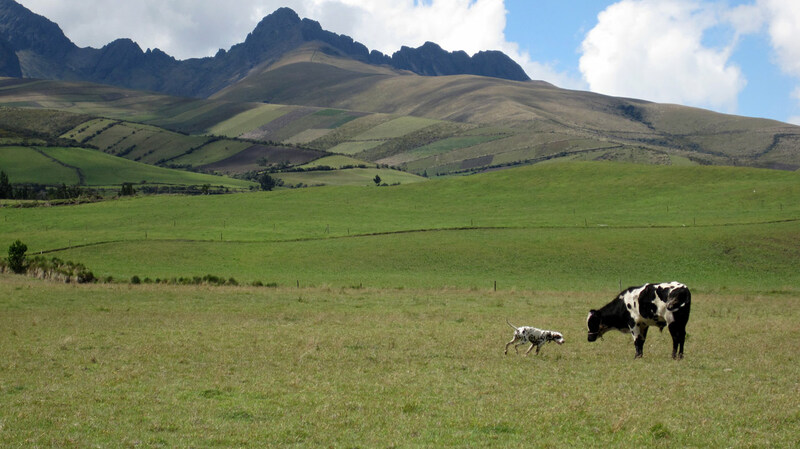 Despite the setback in Popayan, we continued our journey south and welcomed another country under our belt – Ecuador. The bus ride to the Ecuadorian border was actually one of the most beautiful drives, as we hugged the edge of canyons and overlooked lush valleys below. Unfortunately, we didn’t have a camera to take pictures, so you’ll have to take our word for it. Our 5th border crossing went very smoothly and consisted of a quick walk across a bridge and a few smiles to the custom officers who gave us free 90-day visas. Doesn’t get any better than that. 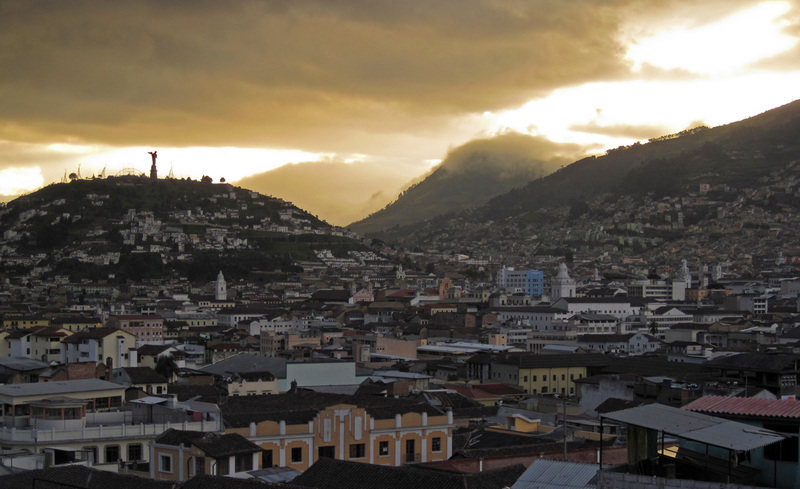 Our first stop in Ecuador was the small town of Otovalo, a lively city most famous for its sprawling Saturday market. Stands occupied the whole of the Plaza de los Ponchos, including almost every side street leading up to it, and featured all kinds of textile, jewelry, artwork and tapestry in the most vibrant colors. We only bought a few essentials, such as a new day bag for me. Although there were wonderful souvenirs at shockingly low prices, we had to resist the urge, since we have no room in our backpacks and shipping costs home are outrageous. We then made our way to Quito, the capital of Ecuador and the second-most populous city in the country. Our time there was mostly administrative, since we were occupied with finding the best deal on a good camera (I use the word “best” loosely, since electronics are at least 40% more expensive here than in the US), and arranging a once in a lifetime trip to the Galapagos Islands! 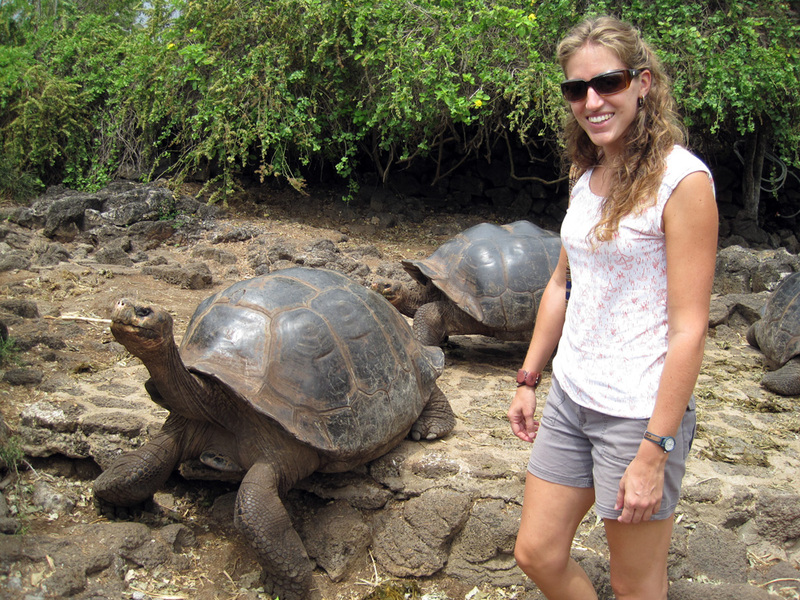 We were mostly successful, since we bought a new Canon and booked our flight to the Galapagos. 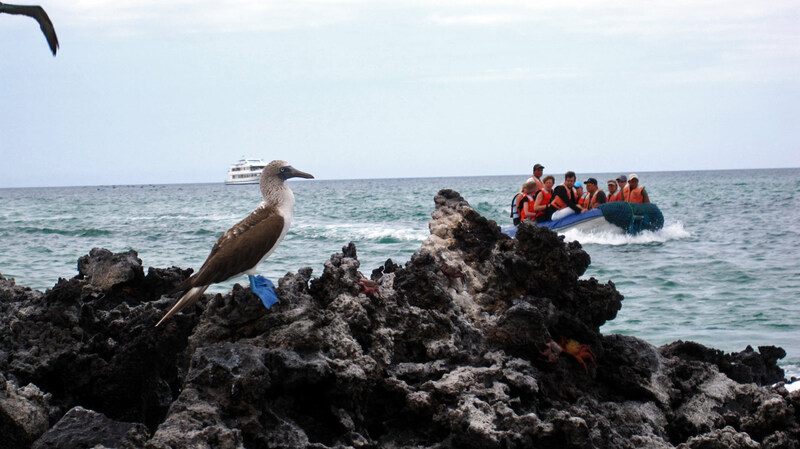 We weren’t quite satisfied with the price of last minute deals on Galapagos boat cruises – which we had heard is by far the best way to visit the islands – so we decided to wait it out and see what we could get once on the islands, fingers crossed. In the meantime, we had a few extra days to spare and were anxious to leave the noise, traffic and pollution of the big city, so we high tailed it to the countryside – best decision we made. 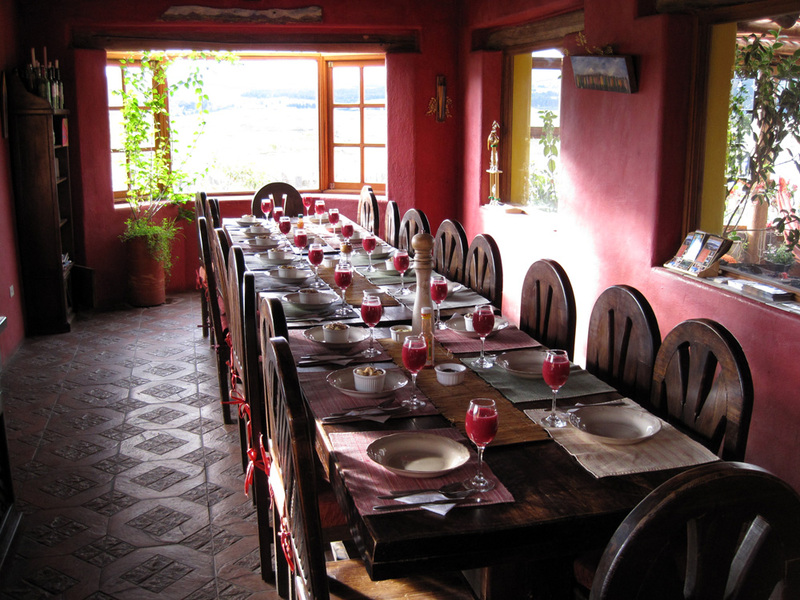 We headed to Cotopaxi National Park, home of the highest active volcano in the world, and stayed at one of the most beautiful places and accommodations we’ve been to yet – The Secret Garden in Cotopaxi. 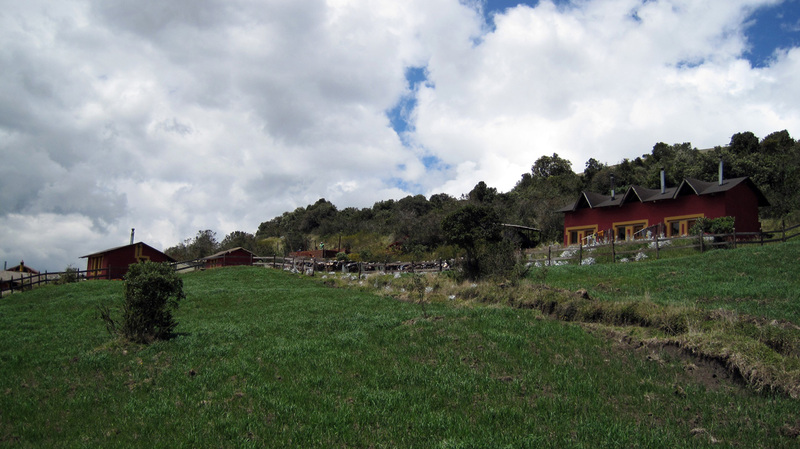 This sustainable and well-managed hostel consisted of dorms, tents and cabins with a warm and friendly lodge where we ate all of our gourmet meals. 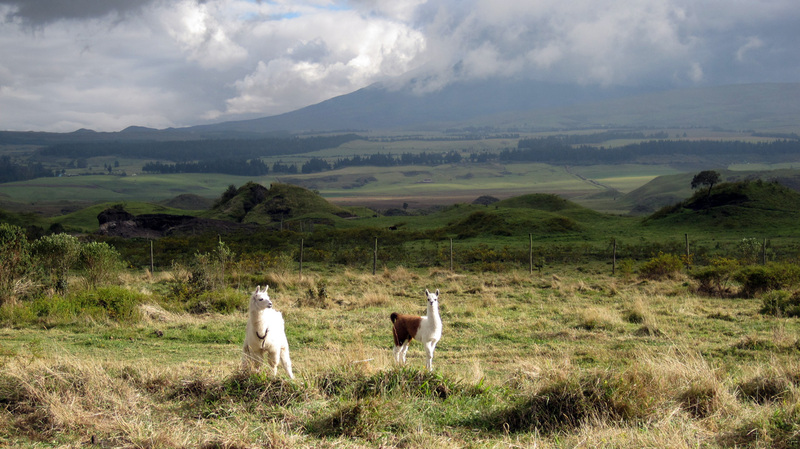 The best part was the view overlooking a patchwork of colorful pastures and meadows with the jutting ice-capped Cotopaxi volcano as the pinnacle. It was truly spectacular and exactly what we needed to unwind and regain our sense of security and peace. 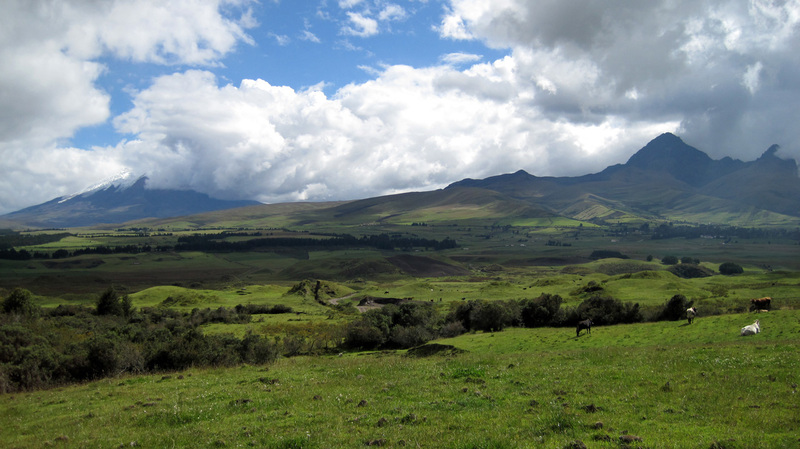 The beautiful countryside of Cotopaxi. The serene grounds of the Secret Garden – we stayed in a cabin on the right. The Secret Garden dining room table prepared for a breakfast feast. Hiking down from the hills behind the Secret Garden hostel. Llama ‘Oreo’ with her mother. 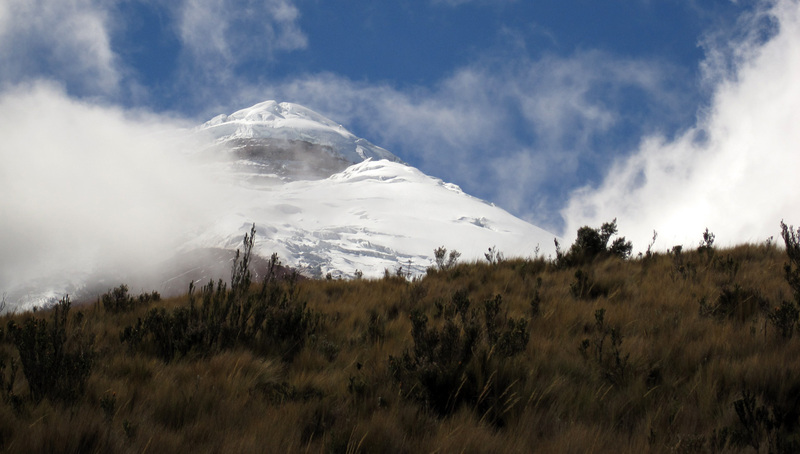 Of course it was not all lounging around, since we went on long hikes around the area and headed straight to the pinnacle itself – Cotopaxi, which means “Throne of the Moon”. A Jeep drove us to the base parking lot, where we continued on foot all the way to the refuge and finally to the foot of the glacier. 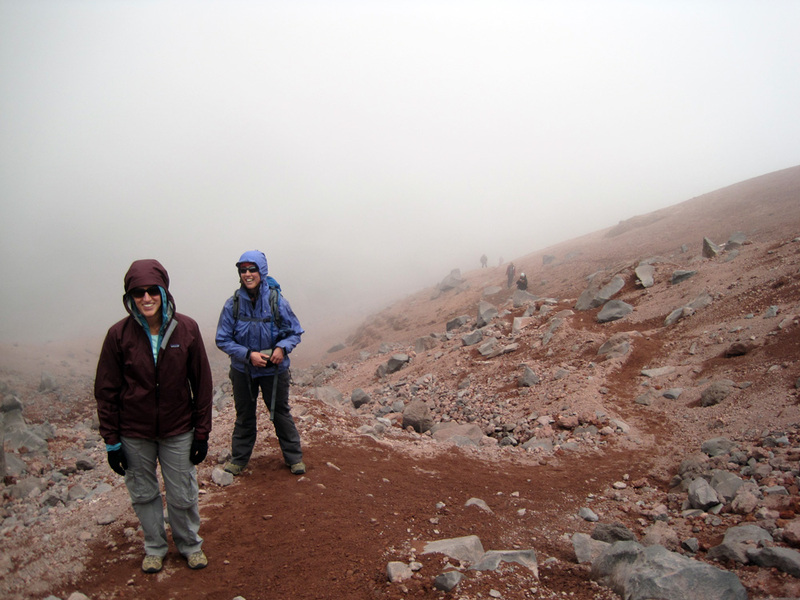 Keep in mind that the plain on which Cotopaxi stands is already at 12,500 feet. 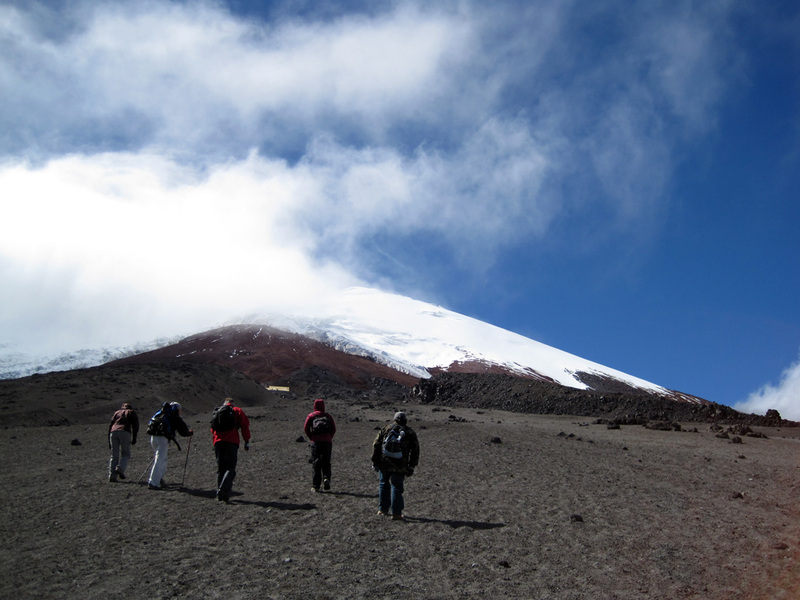 It was easy to feel the elevation, though fortunately staying a few days before in Quito at 9,186 feet helped us acclimatize. 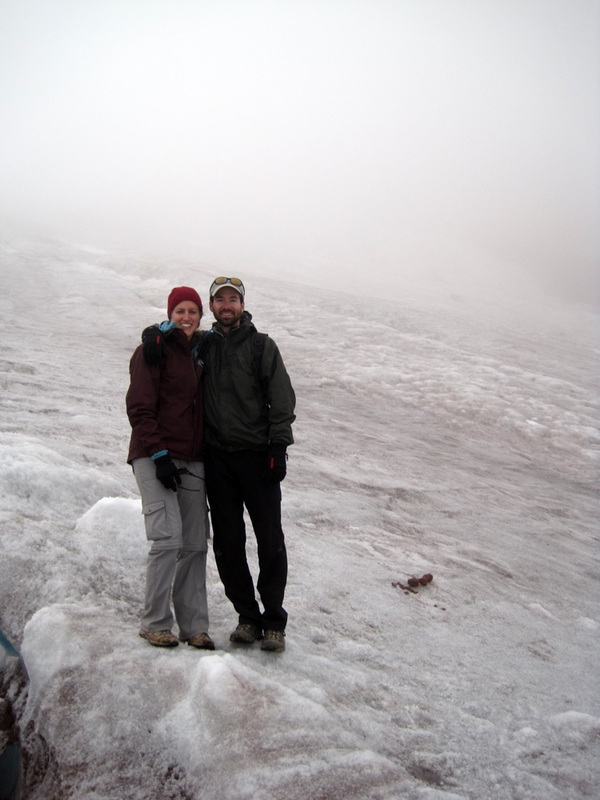 When we finally reached the glacier, we were well over 16,400 feet. This is the highest that I’ve ever been (I haven’t made it to the Himalayas yet like Pat), and it was necessary to take deep breaths. The clouds were rolling in and out so we did sneak a peek at the summit several times and of course at the plain down below, which was as breathtaking. We were also lucky to share the experience with a great group of American girls (and one Dutch man). After we all headed back to the hostel, we cozied up in the lodge in front of the fireplace and enjoyed a wonderful candlelit-meal. 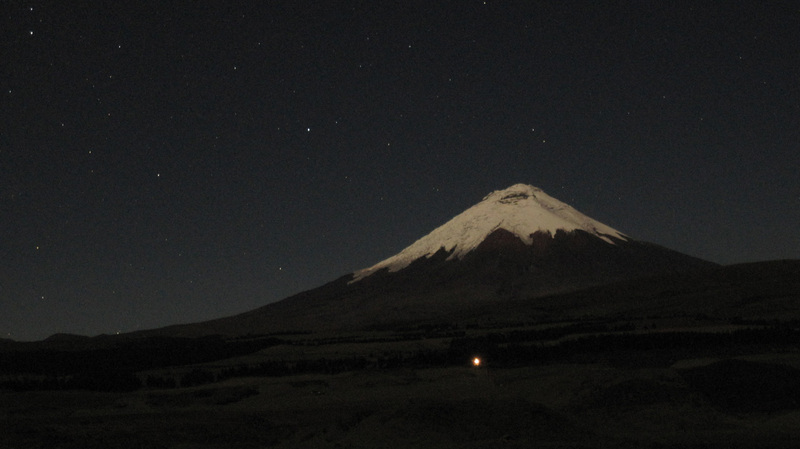 A full moon lights up Cotopaxi: the Throne of the Moon. Cotopaxi gleaming in the sun. The steep hike begins – we’re already over 12,500 feet. On the trail up to the glacier. 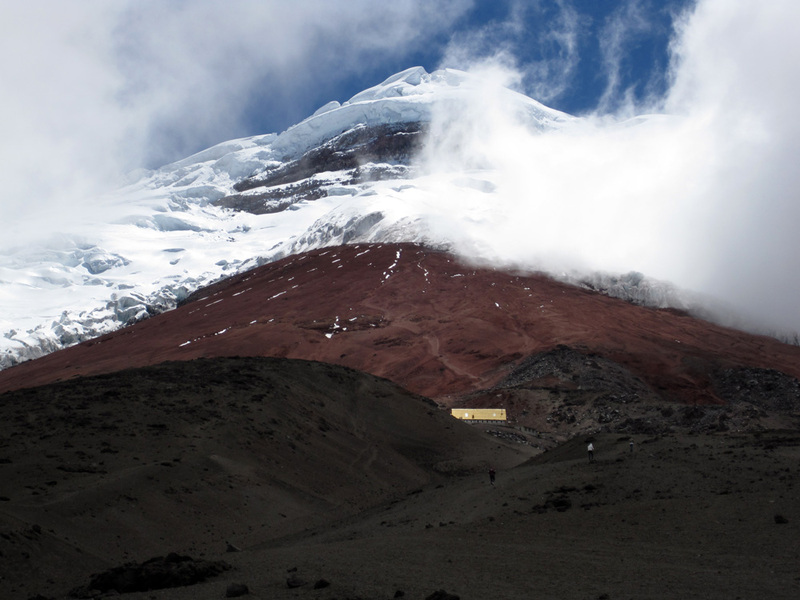 At the foot of the Cotopaxi glacier. 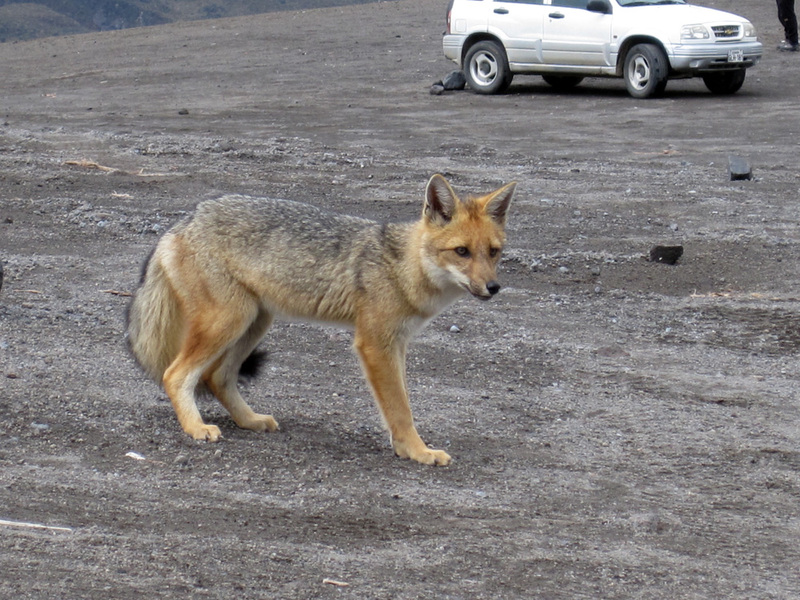 A mountain fox waiting for handouts in the parking lot. We made it to the glacier at 16,400 feet. The summit sits at 19,347 feet, maybe someday? The hostel Dalmatian taunts a bigger version of itself. We weren’t too thrilled to get back to Quito, but it was necessary in order to board our flight to the Galapagos! After countless 12+ hour bus rides winding over mountains, we were ecstatic to get on a plane and have a smooth and comfortable ride for once. They even served us lunch! You hardly find that in the US anymore. 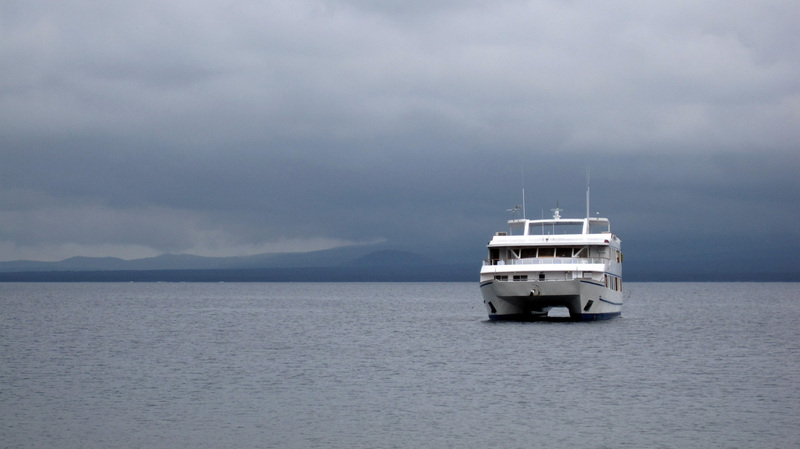 After landing on the island of Baltra, we had to make our way to the town of Puerto Ayora using a combination of bus-ferry-bus. This is where a lot of the boat cruises take off from. We found a local tour operator and asked her to make as many calls as she could to see what we could get at the very last minute (leaving the next day). She was persistent and ultimately successful, as she found us a 5-day/4-night cruise on a first class boat for a third of the price! The next day, we boarded the Millennium – our palatial home for the next 5 days. 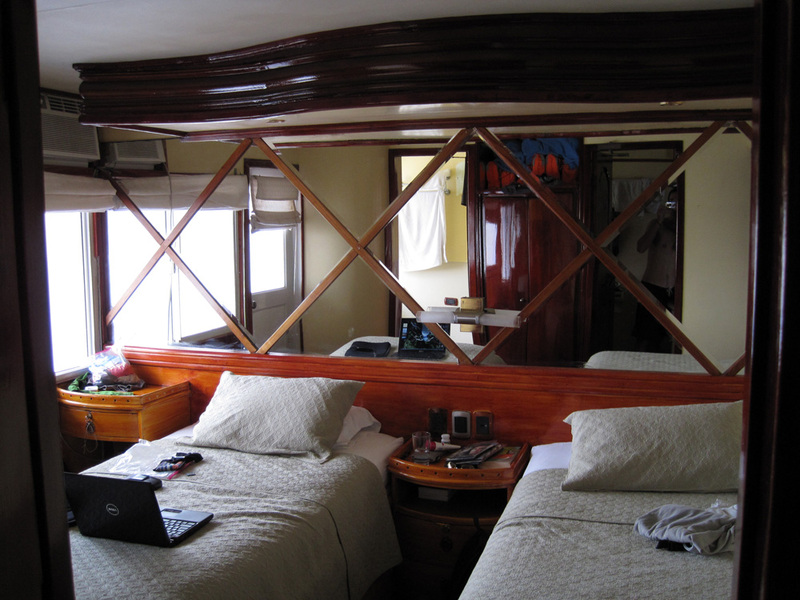 It was exquisite and completely opposite from the Winfli sailboat from Panama to Colombia. 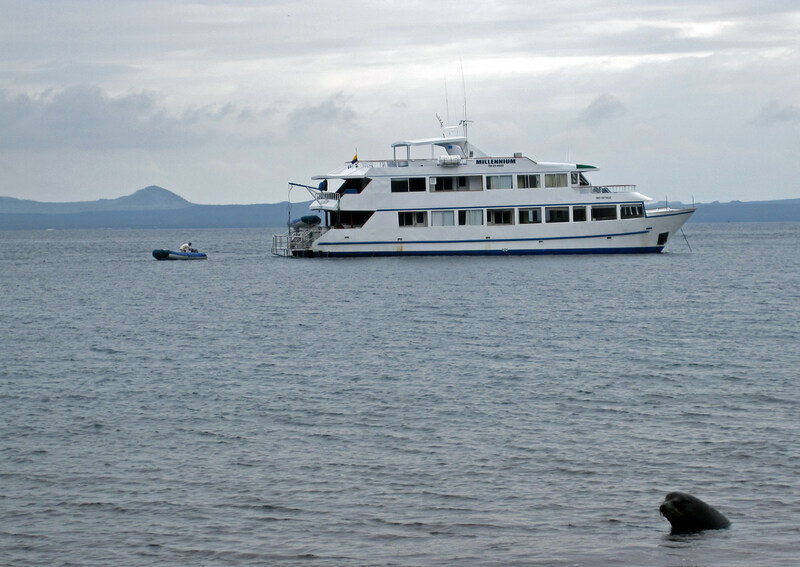 This luxury catamaran was 82-feet long, held 16 passengers in 8 cabins with private bathrooms. The entire boat was air-conditioned, except for the boarding and deck areas equipped with lounge chairs. The food was amazing and served to us at the ring of a bell. Our naturalist guide, Vicky, was very knowledgeable and friendly and took us on at least 2 hikes and 2 snorkels per day to explore the various islands. We motored from island to island mostly at night, so every day we woke up next to a new beautiful island with the day’s agenda already set. We didn’t have to think or work – we just followed and enjoyed. It was a wonderful mini vacation from our vacation. Our catamaran – the Millennium. 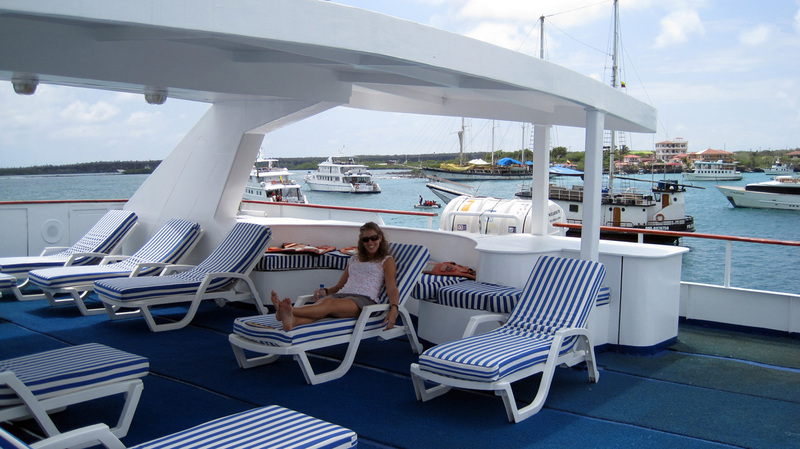 Lounging on the deck of our first class boat, ready to tour the Galapagos! We were lucky again to have a great group on board. The crew all dressed up for cocktails. Our classy room with balcony. 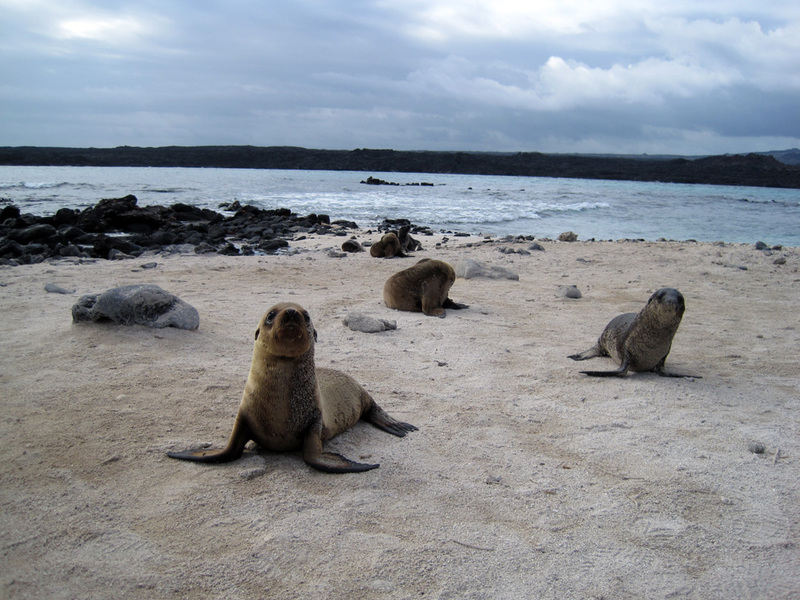 The Galapagos are known for the abundance of wildlife everywhere. They’re not kidding. Around every corner you’re bound to glimpse or step on sea lions, iguanas and loads of crabs and lizards. 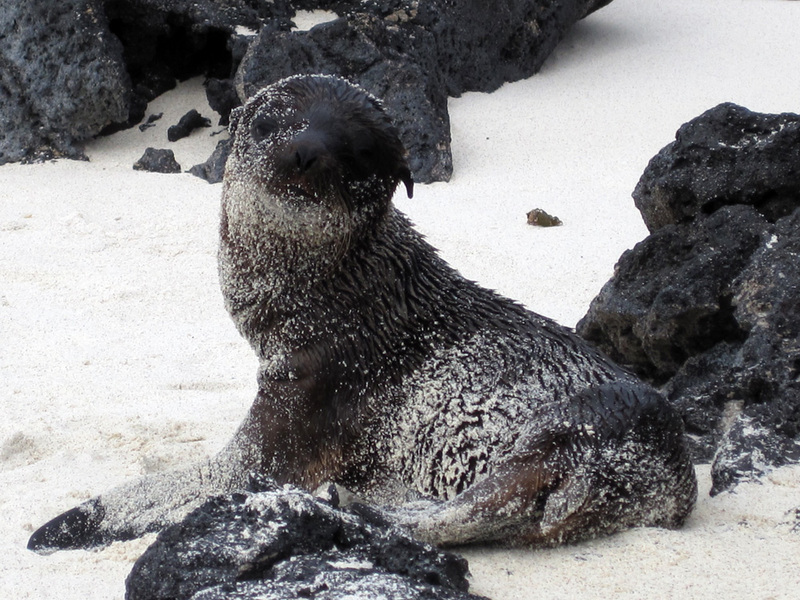 Most of the animals are endemic to the islands, which make it all the more exceptional. We saw giant tortoises and blue-footed boobies and a plethora of fish under water. The snorkeling was out of this world! We swam with all kinds of parrot fish, angel fish, sea turtles, sting rays, sea lions and even white and black-tipped reef sharks. 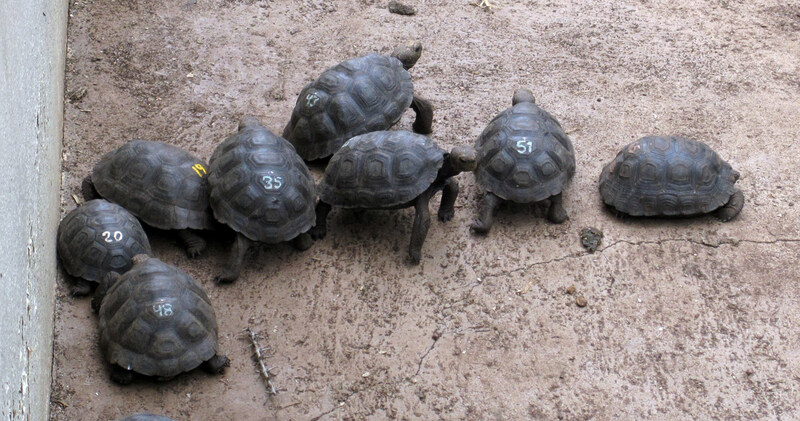 Baby giant tortoises, marked so they can be brought back to their native island when they are of age. 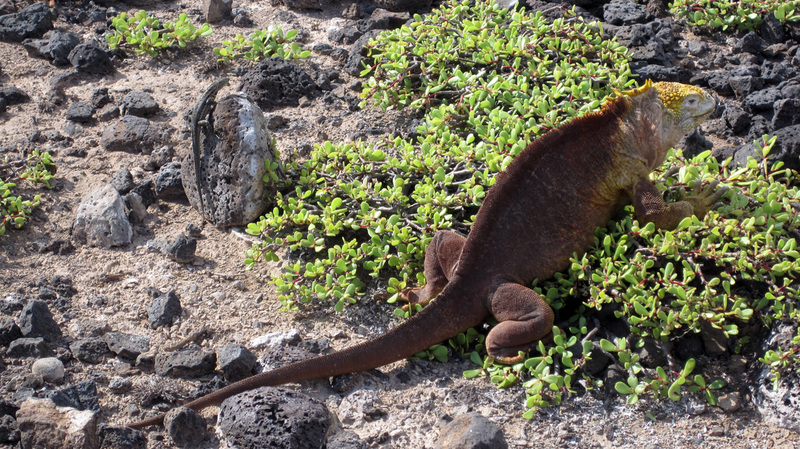 A colorful yellow land iguana endemic of the Galapagos. 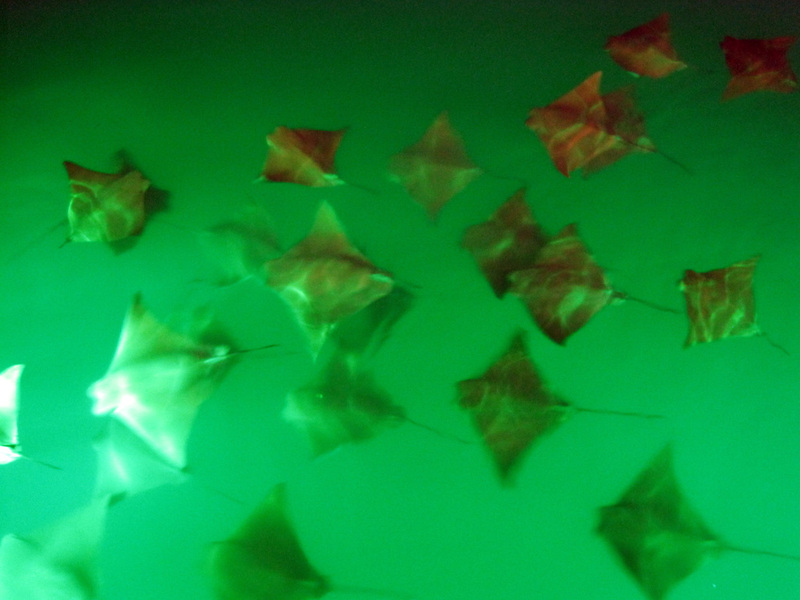 A school of sting rays swing by. A baby sea lion feeding from his mother at our first stop. An alpha male sea lion guarding his territory. One of the famous blue-footed boobies – endemic to the Galapagos and awesome hunters. 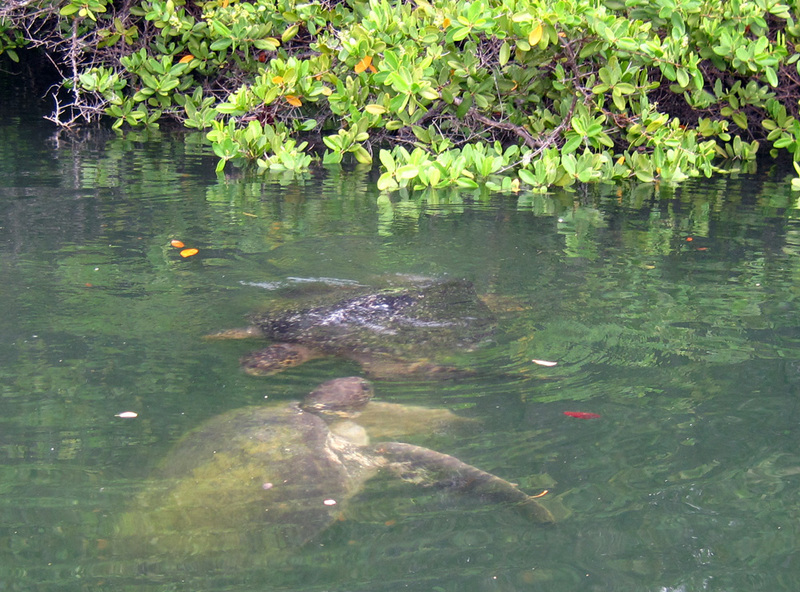 A visit to the mangroves revealed a dozen sea turtles swimming in the lagoons. 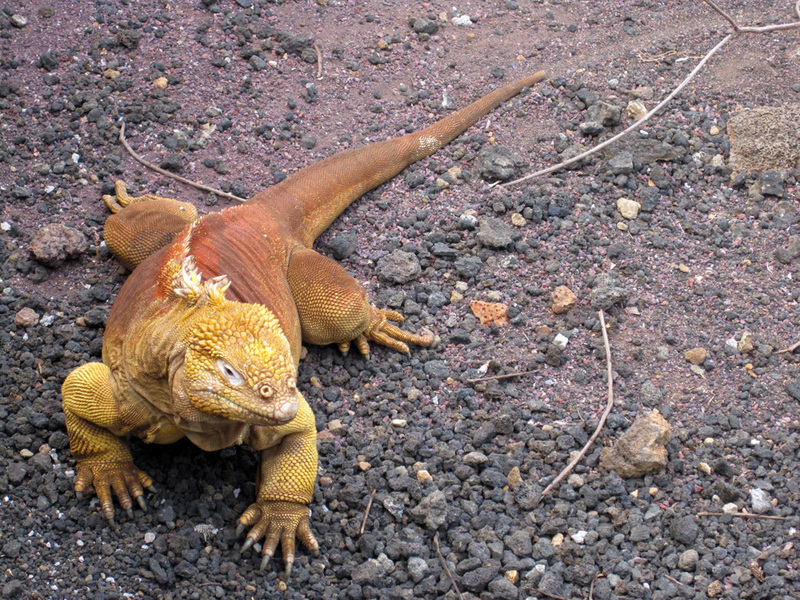 A land iguana to the right and lava lizard perched on a rock to the left. 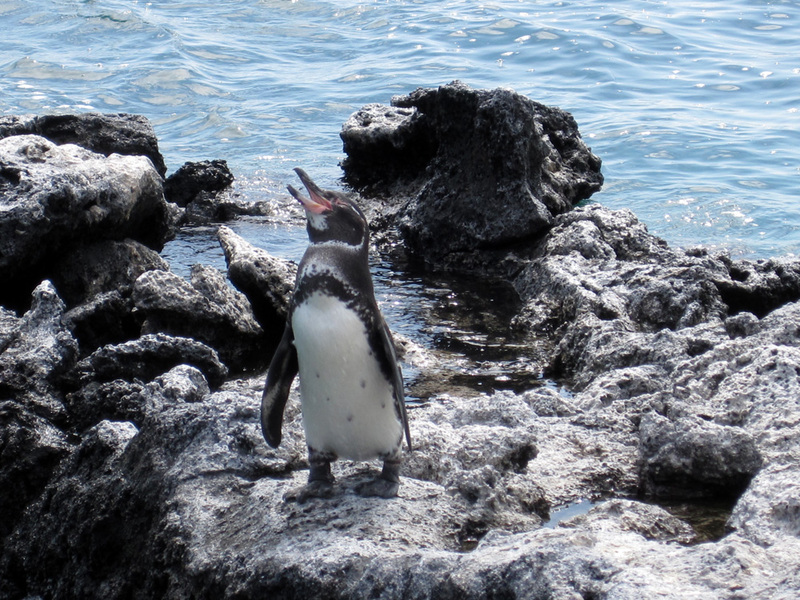 A cute little Galapagos penguin, they were fun to swim with, so fast! 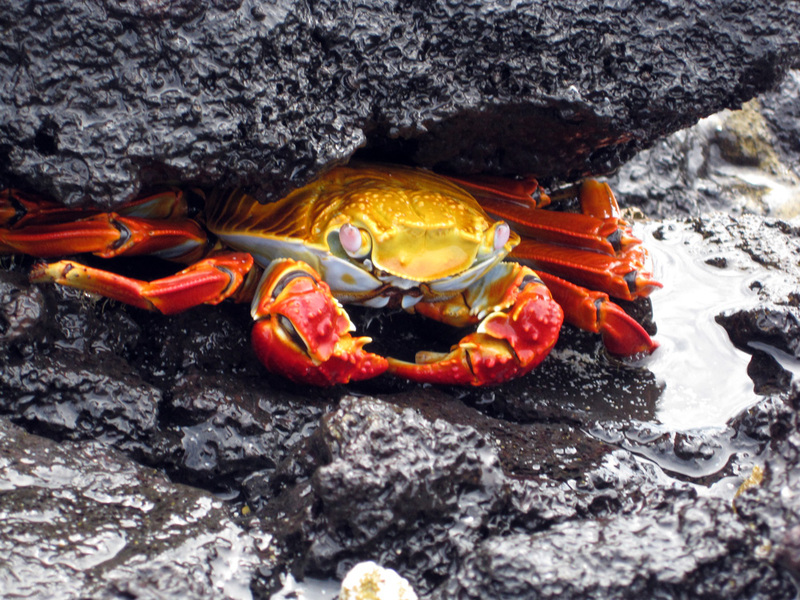 A colorful crab hiding in the rocks. The baby sea lions were just too cute. 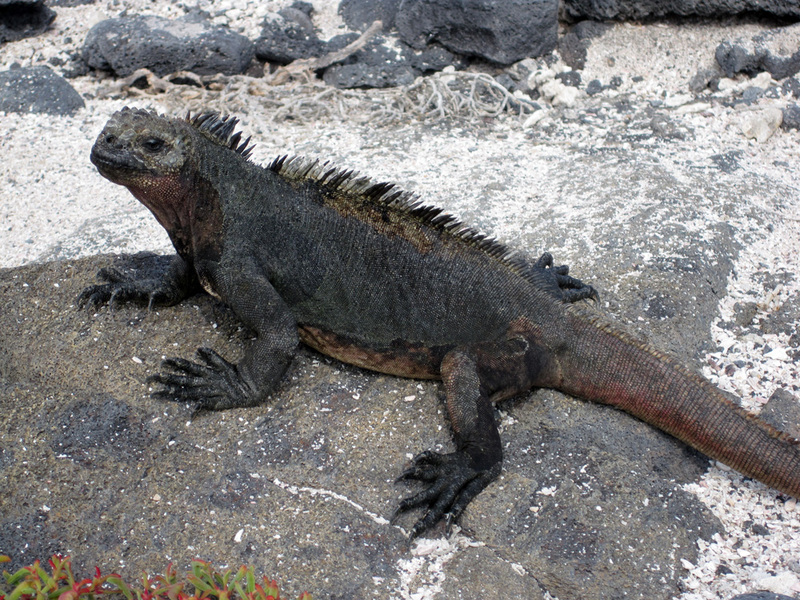 A marine iguana – they are excellent divers. Baby sea lions coming right up to us. Back away slowly. With all of these animals, you’d think that these islands would be overflowing with vegetation. In fact, these volcanic islands are quite arid, with only a few cacti and other small bush. That’s enough for land animals to survive – the water in the cacti is tasty. Jump in the water though, and you understand immediately. It’s an aquatic animal’s dream. 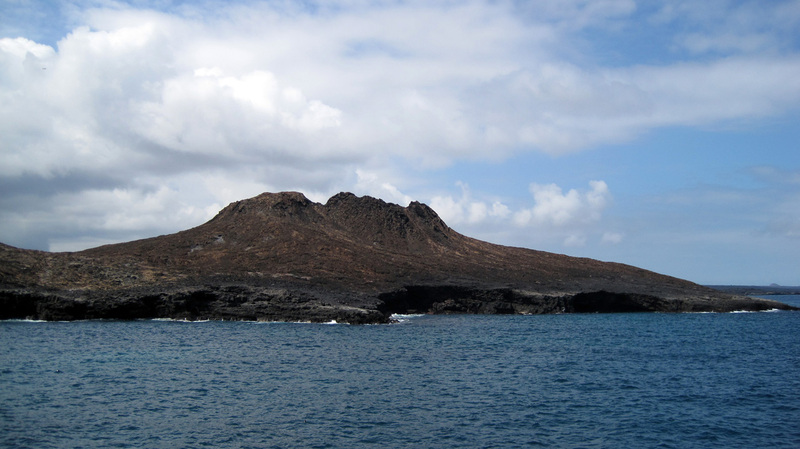 ’The Chinese Hat’ – one of the many arid islands in the Galapagos. 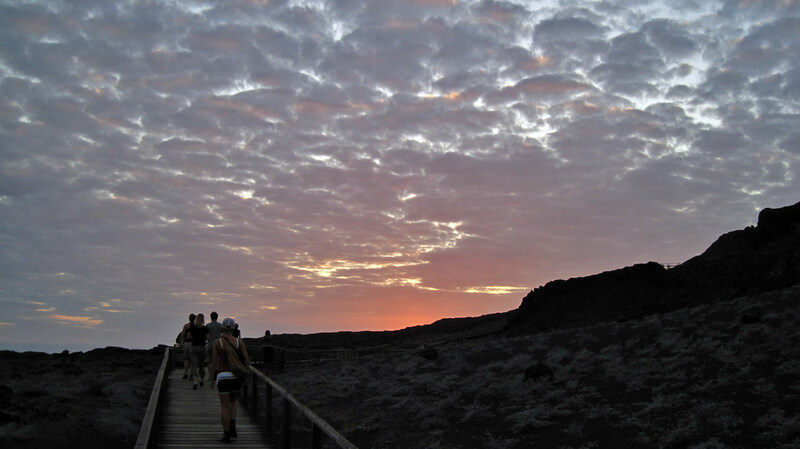 Morning breaks upon Bartolome island. We didn’t get to visit all the islands, but were so happy to have seen what we did, especially on our budget. And that means we still had to splurge, but it was well worth it. And it was a nice break from our usual routine. It’s hard to see everything the continent has to offer, so we do our best to choose what we think are the highlights. 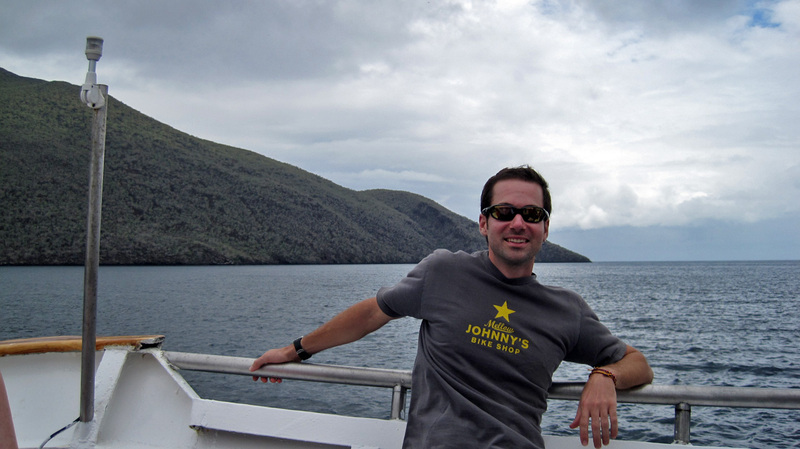 Cruising around the Galapagos was definitely one of them! Good choice to splurge on this one! The catamaran looks fancy shmancy. 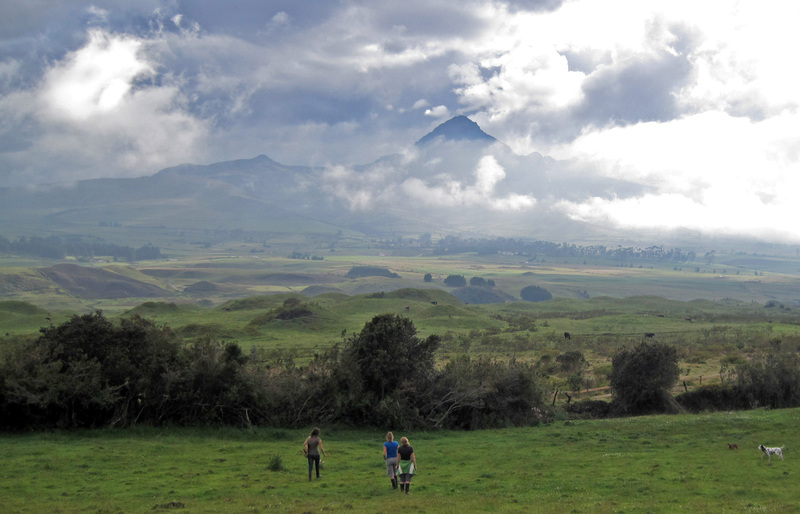 Quito and Galapagos as well as Cotopaxi. Did you see the wild horses? Your pictures brought back such good memories. 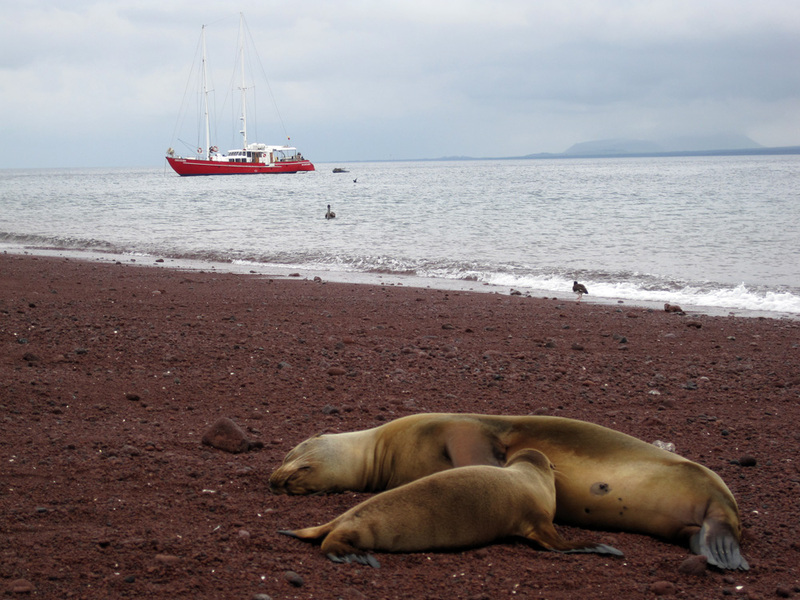 Kim and I did this trip and yes, Galapagos is better seen by boat. 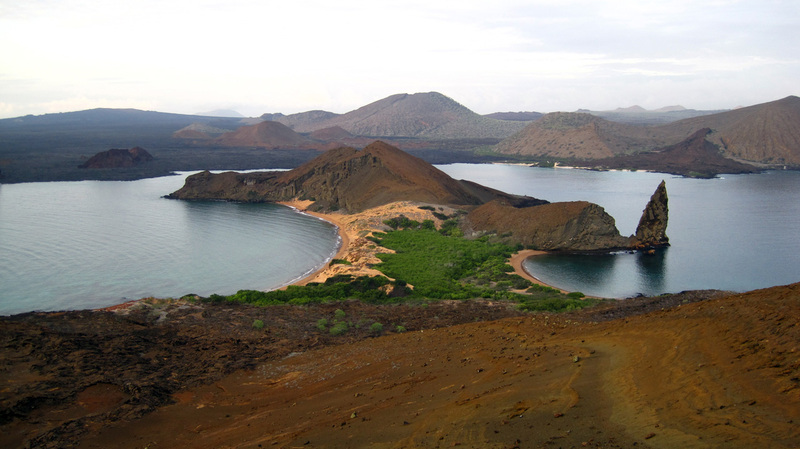 You know that Bartolomé Island is one of the most photographed landscape in Galapagos, taken from the belvedere. 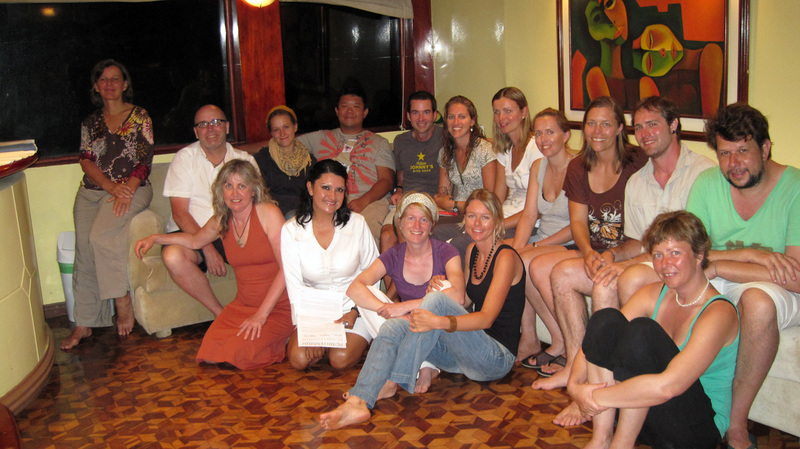 I am looking at your pictures and have reopened our album. A little trip in the past. Enjoy!